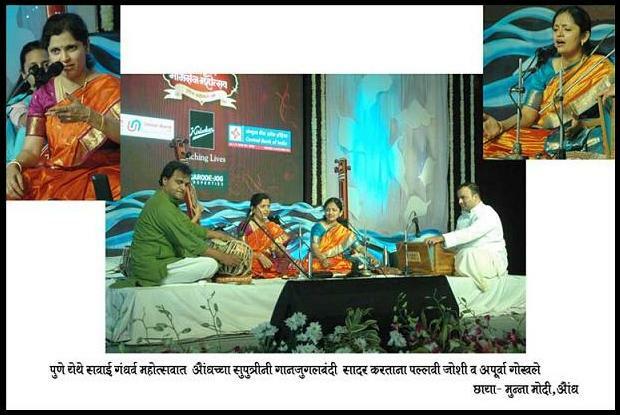 In the second session with which this year's festival concluded- singers Apoorva Gokhale and Pallavi Joshi displayed command on Raga Multani in vilambit bandish 'Kawan desh kari' and drut bandish 'More mandirava.' They then sang Raga Marwa with 'Ae maee ree' with 'Gunijan sab hot, gun ki charcha naahi' in drut beat. They finished with a Kabir bhajan, which got a big applause from the audience. The evening opened on time with the saha-gayan of the sister duo of Pallavi Joshi and Apoorva, granddaughters of Pt. 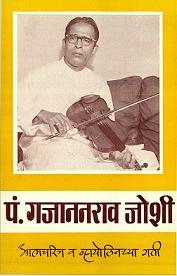 Ganajanbua Joshi, a violin virtuoso and himself an eminent singer in the Gwalior tradition. Apoorva, a disciple of Manohar Joshi, Pt. Ulhas Kashalkar and Pt. Shankar Abhyankar; and Pallavi, who is a biotech graduate and an MBA, chose a different format for their presentation, choosing to sing bada-khayals in two ragas namely Multani and Marwa, instead of the set pattern of one longish raga, followed by a shorter bandish in another raga. The khayal in Multani was set in Jhoomra, a pet taal in the Gwalior style, and a first in this year's Sawai till now, whereas the one in Marwa was set in Tilwada, another Gwalior favorite. Laykari was the predominant content of their presentation and their command over it was professional. The sisters could achieve a near perfect synchronisation between them, thanks to their rigorous talim in the Gwalior-Agra-Jaipur traditions. Apoorva with her well-rounded voice and Pallavi with a sharper and slightly nasal voice sang the jod bandish of Multani set in Teentaal, while the one in Marwa was set in Ektaal followed by a tarana set in Teentaal. While the duo had excellent command over laya, a more peaceful lingering on the notes to bring out the mood of the raga would be a welcome dimension to their presentation. They concluded with one of Kabir's bhajans.